Microphone mounting system with adjustable depth.Five 6.5 inch panels total with the outer two adjustable/foldable panels on hinge joints to open and fully close in every position in-between. 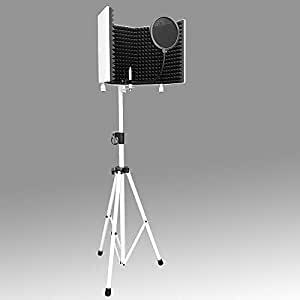 AxcessAbles SF-101W (White) Recording Studio Microphone Isolation Shield Redirects the Internal Sound Energy Away from the Microphone for the best quality recording. The SF-101 gets maximum sound isolation by blocking reflected sounds from the recording environment to the microphone. Easily mounts to most heavy speaker stands and has flexibility to adjust the microphone proximity. This stand is well built and does the job in minimizing background noise. Very impressed. Have it in the corner of my little studio. Look you have to understand that this is what it is… and that is a PART of a solution to minimalize the negative acoustic factors in a space (echoing, feedback, external noise.) That being said, I still utilize this in a walk-in closet where I allow the clothing to be a part of the solution. My testing certainly indicates that this isolation shield/stand DOES HELP however particularly with regards to echo reduction. For my current home studio needs it does the job. It is portable enough to (carefully) move it from my main studio space to my closet when needed. I will say that it is quite well built and very effectively supports my Blue Yeti microphone and pop filter. I choose to suspend the microphone rather than mounting it upright… no problems here at all. Just invert the shield on the stand and it works perfectly! At $119.00 this was a very cost effective tool to help improve the sound of my recordings. It is not a whisper room substitute and not meant to be. I would quantify it as a reasonably effective noise suppression tool. I am quite satisfied! Happy with this purchase. The stand is solid and holds the isolation screen easily. The screen is very heavy but not an issue for the stand. Appears to be well build for the price. Like others have stated the box it was shipped in was beat to hell and the stand actually came out the bottom when I picked up the box to bring in the house. Packaging was horrible and the adhesive for the grip is kinda peeling off. Other than that it’s pretty solid and really sturdy. Well made. Does a great job of isolating my Apogee Mic. One thing though, make sure you have a way to hold your copy if you’re reading something. I bought this for use in home voice-over work and had to rig something up. Product came damaged. Foam is peeling off. Spend your money on a different product. WITH A LITTLE SUPER GLUE THIS IS A GOOD PRODUCT FOR WHAT IT COST.. MY BOX DIDN’T COME BEAT UP LIKE MOST OTHERS DID. AND THE SHIPPING WAS EXTREMELY FAST. After using this isolation shield, I’m very happy how majority of echo sound in my room doesn’t get picked up by the microphone. I still plan to invest in some acoustic foam for my walls to attain better quality sound but this shield is excellent for my current podcast recordings. I haven’t used the stand yet as I set the shield on my desk, but I love having the mobile option. The additional pop filter is a nice bonus. Sound absorbtion is great. Tried it out with a couple different mics. The stand is extremely durable. The only reason I gave it 3 stars, is because the “mic holder” won’t securely stay supported and I can’t attach a microphone to it safely. It seems I’ve gotten a different attachment piece than what is shown in the assemble instructions. The middle “nut” stays attached perfectly with out the mic holder there, but once I try to attach it, it just doesn’t give enough room to stay attached to it. Anyone else have this problem?